On July 14, Woffice, a Chinese property service company located in Handan, took part in an exercise that appeared to be quite similar to Halloween. Employees were given the choice to wear a black-and-white mask at the office, in an effort to reduce stress. With faces hidden behind thin plastic, workers could focus on their duties without worrying about the pressures of smiling, the stigma of yawning, and the boorishness of rolling their eyes. So, what mask did all the workers chose? 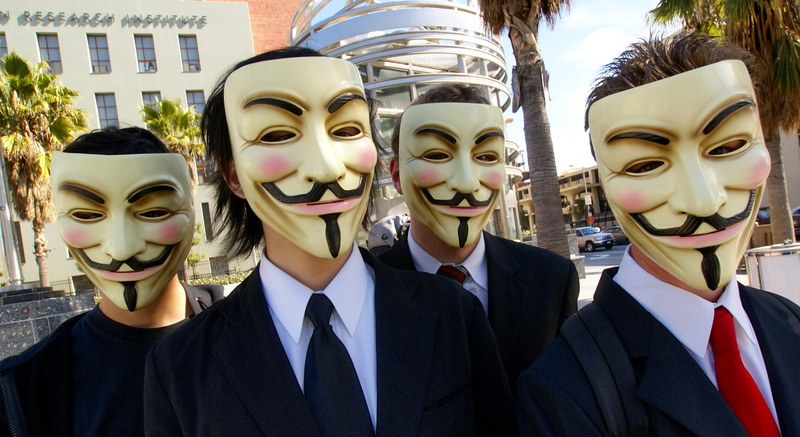 For the day known as Faceless Day, employees at Woffice chose the character No-Face from the beloved anime, Spirited Away, and Guy Fawkes from V for Vendetta. Now, it might just be me, but I am not sending my resumé to Woffice anytime soon. If a business needs to use masks to ease tension within the workforce, I can’t imagine the monotony of working there any other time of the year. True, unorthodox exercises such as Faceless Day are gaining popularity in offices all around the world, but how about something less juvenile? I hate the idea of dress codes. I hate it at fancy restaurants, I hate it at nightclubs, and I sure as hell hate it in the workplace. Yes, there is an emphasis on professionalism, but having to wear a suit and tie does not make you a productive worker. It’s funny that wearing jeans to work for a day is considered a perk in some offices. For a year and a half, I was a Starbucks barista. Starbucks has a relatively strict dress code where male employees have to wear black or beige pants—excluding jeans and sweat pants—while on the floor. I always wondered why the fabric mattered. Who is peeking behind the bar, looking under my green apron, and at my pants? I don’t know, but apparently what I wore made your mocha taste better and myself a leaner thinker. Needless to say, I wore black jeans for most of my employment and nobody (except the manager) made a big deal about it. Well, a few co-workers pointed it out, but they were merely inspired, and a bit frightened, by my rebellious ways. Don’t even get me started on Fridays at Starbucks. During my stint, only the day partners were allowed to wear T-shirts instead of collared shirts. Ignore my sarcasm, but that was a real privilege. I believe many companies waste too much time, money, and effort trying to find creative (and not so creative) ways to motivate and calm their employees; Faceless Day is creative, while laid-back dress code days aren’t. Ultimately though, these efforts are not going to see much, if any, return of investment. Don’t enforce rules and then take them away, expecting the workers to be more relaxed. Don’t be gimmicky. A workplace is for grown-ups, so treat employees as such; let them make their own decisions. And if you really want them to relax after a hard product sprint or dinner rush, buy them a beer, give them a day off, or take them on a retreat. Don’t give them something else to wear.